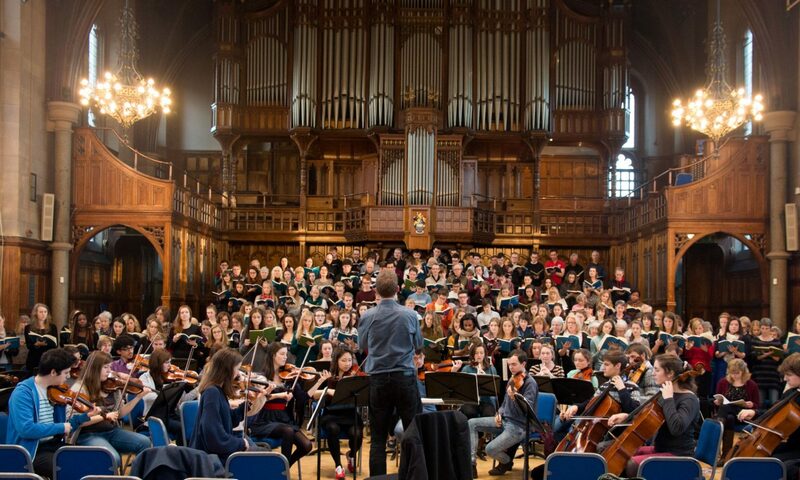 The University of Manchester Chorus was established in 1936 at the same time as the Victoria University’s Department of Music (hereafter ‘Music’). Its founder was Humphrey Procter-Gregg CBE (1895-1980), Reader and subsequently the University’s first Professor of Music from 1954-62. “P.-G.”, as he was usually known, envisaged Chorus as a body of singers that would include staff and students from the University as a whole, not just in Music, as well as the wider community. His original aims have been honoured ever since. Procter-Gregg himself conducted Chorus in the early days, including his own compositions in the programme. He was succeeded as Professor of Music by Hans Redlich, a Viennese émigré who as a young boy met Mahler, and who wrote a book about him for the Master Musicians series. In 1963 Brian Runnett was appointed Lecturer in Music and University Organist and was principal conductor for the next four years until the arrival of Keith Elcombe in 1967. Keith led Chorus uninterrupted (he lost just two rehearsals to indisposition) for the next thirty-four years, until serious illness brought his career to a premature close in 2002. John Casken rescued the 2001-2 season, stepping in to conduct a Bach Mass and the Brahms Requiem, and was able to take the helm for 2002-3 until pressure of other commitments forced him to step down. Following John’s departure, the posts of Conductor and Musical Director were separated, clearing the way for a succession of younger conductors, often at early stages of their careers, hence the relatively high turnover: James Burton (2003-4), Stephen Williams (2004-5), Marcus Farnsworth (2005-2009), Robert Houssart (2009-10), Gregory Batsleer (2010-12), Justin Doyle (2012-16) and Robert Guy (2017-) – all differing in their approach, but all inspirational. Conductors have traditionally chosen repertoire, in consultation with Musical Directors, the Chorus Committee, and sometimes the membership at large, informed by the credo that a university chorus should reach out beyond the stalwarts of the choral canon, vital though they are. Often the first concert of each season has focused on a more familiar piece, the second on something less familiar. Thus, across eighty seasons, and more than 160 concerts, there have been multiple performances of Elijah, the Brahms and Verdi Requiems, The Dream of Gerontius, The Creation, and Masses in C by Mozart and Beethoven. At the same time, Chorus has performed less familiar works by often-visited composers: Poulenc’s Stabat Mater, Mendelssohn’s St Paul or Britten’s Paul Bunyan. Indeed, reaching back through the history of Chorus produces some surprises. In December 1967 Hans Redlich conducted a concert performance of Berlioz’ Damnation of Faust; in 1976 Chorus sang Honegger’s unusual dramatic psalm King David; in December 1992 Keith Elcombe’s scholarship yielded a world premiere of the original version of the Janáček Glagolitic Mass; and a British season in 1993-4 saw, in addition to Belshazzar’s Feast and A Child of our Time, Delius’s Sea Drift and Howard Ferguson’s Dream of the Rood. Nor have the challenges posed by more adventurous works been merely musical. Chorus members have had to come to grips with unfamiliar texts in a variety of languages: Hebrew in the case of Bernstein’s Chichester Psalms (1988 & 1995); Polish in the case of the Szymanowski Stabat Mater; Church Slavonic for John Tavener’s Svyati, and again, this time with strongly Czech inflexions, in the Glagolitic Mass (1992 & 2010); even Hungarian (Doberdoi dál 2014). Not to mention the rapid-fire tongue-twisting Italian of Verdi choruses (2014). Every concert is memorable in its own way, not just those involving a UK premiere, like Górecki’s Ad Matrem (2002); or indeed a world premiere: for the 2002-3 season, Chorus Life Member Paul Hindle commissioned Howard Skempton’s That Music Always Round Me in memory of the then recently deceased Keith Elcombe. One concert, however, stands out if only for its venue. In recent times Chorus has performed in the Victorian splendour of the Whitworth Hall (1883-7, completed 1902), by Alfred and Paul Waterhouse. Further back a frequent venue was the equally lofty, yet somehow intimate, Church of the Holy Name of Jesus, Oxford Road, by Joseph Aloysius Hansom (1869-71). But 2009 saw Chorus in Manchester’s major modern concert venue, the Bridgewater Hall, for the first and to date the only time (another event there is envisaged). Britten’s War Requiem had featured back in 1984 and 1996, but this occasion stands out not least for its trio of stellar soloists – Amanda Roocroft, Roderick Williams and Allan Clayton. Manchester Music alumnus Marcus Farnsworth conducted, and also spearheaded the substantial organisational effort on the part of the Chorus committee, with vital input coming also from staff in Music. For many years the organising committee of Chorus was small, consisting of just a handful of students, plus a senior secretary and a conductor/music director. But the committee mushroomed after Keith Elcombe’s death: a coalition of the willing formed under the imaginative leadership of John Casken to support Keith’s long-serving secretary Gerard McKenna and to re-distribute functions. Initially the balance between young and older members was roughly even, but over time student participation has steadily increased. Many students have gone on to transfer their committee-acquired skills to future employment with major orchestras, conservatoires and other musical organisations. Older co-opted committee members provide continuity and institutional memory. One of the problems associated with a non-auditioned choir open to amateurs (in the best sense) and under-confident sight-readers is that emerging professionals can feel insufficiently stretched by the Chorus experience. To address this issue, the Cosmo Singers – named after the main rehearsal space, the Cosmo Rodewald Concert Hall at the University’s Martin Harris Centre for Music and Drama – came into being in December 2010. Since then it has gone from strength to strength, not only lending support to less able singers but also giving concerts in its own right, and even undertaking foreign tours. Being able to call on gifted performers has emboldened conductors to incorporate harder repertoire, combining for example the Duruflé Requiem with Dvořák’s Mass in D; or Arvo Pärt’s Adam’s Lament with Mozart’s Great Mass in C Minor. Our present conductor, Robert Guy, has pledged to integrate another elite ensemble, the Ad Solem choir, into the University’s choral family. This new interdependence promises much for the future – to have “three choirs” feels auspicious indeed.